Have you see the buzz around Gypsy Wife Pattern? Does this not look interesting and exciting?? Possibly a challenge or a great gift for next Christmas? Intrepid Threads and Amitie Textiles are both offering BOM’s (Block of the Month) for this quilt. I really want to do this pattern but I did not want to do a BOM, where fabric is provided as part of the price. The reason, simply is, I have enough fabric and I would like to make my own Gypsy Wife blocks with my current stash. Interested in making and following a group of folks who are also interested in making it, so we can meet and experience it with others. Join in with us, on flickr – Gypsy Wife QAL. Grab a button, if you want for your blog (see below). Schedule will be posted at the end of this week. Expect it to have a feature block and a couple of filler blocks per month. First month for blocks would be February and the final blocks to finish up in December. Buy your pattern, and select your fabric, in January. A link-up will be provided each month, where you can link-up a post or pictures (i.e. Blog is not necessary). I bought my pattern @ Westwood Acres on Saturday, and it arrived yesterday (Monday). I have added additional online shops that offer the pattern for purchasing, to a post, on Flickr. I am also, looking into getting a couple of give aways for folks that link-up, during the year. If you are interested in participating in the giveaway’s, please send me an email: ml_wilkie@hotmail.com. Here’s the button you can use and I hope to see y’all over on Flickr. 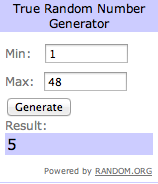 and #5 was Carol B. I will be sending you an email for your mailing address. Congratulations!! 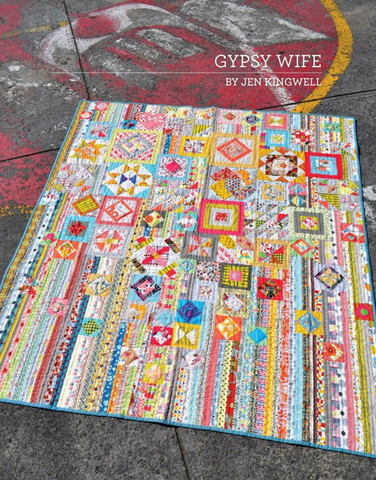 This entry was posted in Uncategorized and tagged Book Review Tuesday, giveaway winner, Gypsy Wife QAL, Gypsy Wife Quilt Along, pattern on January 7, 2014 by mlwilkie. Thanks, I am excited. How are you doing? Feeling better? Yip! Yip! Yipeeeeeee!!!!! I’m THRILLED to have some Gypsy Wife Friends! I did pull the trigger on the Intrepid Thread BOM, but I plan to mix it up a bit with my stash. Can’t wait, and I’m so excited we’re doing this! I plan to earn “Biggest Gypsy Cheerleader” award; no one will be able to hide from my encouragement!!! It’s a beautiful quilt. I’d love to see it done in deep jewel tones with splashes of brights. Look forward to seeing your mixed up version – it’s always interesting to see how people change things to suit their personal aesthetics. Wish I had the time…. Come join us 🙂 It would be great to have a few more folks. Ughhhhhh. Why am I over committed. This is my dream quilt. I’m obsessed. How difficult does the pattern look? Ahhhhh. I want to join. Love it so much!!! I can’t wait to see what colors you use!!! It looks a little scary if you look at it as one whole thing, but all the individual parts are well (well!) within your abilities (and virtually everyone’s if they take a little time on the few marginally more complicated blocks) and then it’s all just assembly, which I think will be the only challenging part. The actual blocks aren’t that complicated. I think it is more the detail and busy-ness of the quilt that makes it look so overwhelming. OOH this is totally something I’d do! The quilt looks awesome and it just so happens that my husband’s family IS gypsy, so I am in fact, a gypsy wife, lol!! How perfect is that?